Between Steam, PSN, WiiWare and Xbox Live Arcade there are a huge variety of games from a variety of genres available to download - some from professional big-name developers, others from independents and bedroom developers. In 8brit's Download of the Week we highlight one such game and discuss why we think you should play it. We do not limit ourselves by release-date, price or even metacritic score - the only criteria is that it should be downloadable and enjoyable. 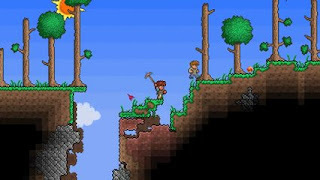 This week it's indie hit Terraria. We appear to be living through something of a golden-age for independent developers and original ideas. One of the stand out success stories of the past few years is the hugely popular Minecraft - a seemingly bonkers idea that has happened to sell 2.5 million units. Terraria, the recent Re-Logic release, very much takes its cues from Minecraft, combining its game mechanics with something of a love-letter to 16 bit RPGs and action adventure games. Terraria is an oddity, a game that shirks the quick-play and easy-access mentality of most small-scale downloadable games for an at times unforgiving blend of construction and adventure. From the off when you're asked to dictate the colour of your character's appearance by manipulating RGB values it is clear that this is not a game for the casual gamer. The underlying concept is as follows - your character must explore and utilise the resources of the randomly generated surrounding world to create ever more complex items, in the meanwhile interacting with NPCs (who can 'move in' to your home) and, importantly, staying alive. What can be deemed Terraria's strength is also what some would refer to as its weakness. It is a game dictated by trial and error. The only thing close to hand-holding is the Guide who is located near your start point who will helpfully tell you what you need to do without explaining how. This approach, however, means that when you do achieve something you very much feel that it is your achievement, that it is something you figured out. A good example of this is the first time you experience night-time in the game. You are warned that you will require shelter and weaponary come the night but this does not prepare you for the sheer tension and terror that this very simply-presented game is able to create. As the light dims, if you are unsuitably prepared all you can do is stare at the almost pitch-black screen as some unseen enemy repeatedly attacks you. If you fail to prepare for your first night in the world, you will surely have learned your lesson by the second night. This idea of self-exploration is what also leads to the game's compulsive aspect, you are driven by wondering "what's round the next corner?" and "What useful items can I harvest from this previously unexplored landscape?" There is a great sense of wonder that overcomes you as you realise for the first time that you are able to construct a platform to cross a nearby gulf of water, that you are able to pick-axe into the ground and literally dig yourself a hole. Terraria is not a game for everyone, it is a patient-person's game. It harks back to an earlier time where a player wasn't guided step-by-step through the game world but left to their own devices. With Terraria you very much get out what you put in. Those looking for a fast-paced action game should look elsewhere, but those who are willing to take the time to truly get to grips with the game mechanics will find the Terraria distinctly individual and highly rewarding. Terraria is available to buy on the PC through Steam.